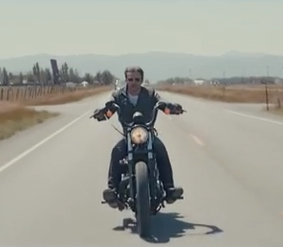 Don't get me wrong, but whenever I watch the music video of Bonfire Heart by James Blunt, I am reminded of the motorcycle scene in The Twilight Saga, where Bella sees some mirage of Edward while riding a bike. But what I am reminded more is the nice scenery in the background. Nature has been the forefront of my existence. It brings solace to my already miserable life and seeing mountainous landscapes in the music video brings me life. This English surrounding is definitely a place to die for... a must-visit bucket list item. In order for you to relate on what I was saying, watch the music video of Bonfire Heart by James Blunt. The idea of traveling makes this music video relatable. Everyone of us aspires to travel and live freely where we can meet and rub elbows with new people of different culture and way of living, giving us new experiences and memories. In fact, this video almost triggered in me a desire to buy a huge motor bike as well and traverse the whole country with it. Bonfire Heart is the third track in the upcoming fourth studio album by James Blunt entitled Moon Landing. This lead single has been released digitally last July and will be officially released in October preceding the release of the album.